I feel like summer is the perfect time to take a load off, take a long vacation and just REALLY relax. At least for me, it seems to be one of the only times in the year where I force myself to disconnect a bit from my ‘always at my side’ phone and ‘never be more than a few hours without’ laptop. While I rarely take more than two-three days off at a time (hi, my name is brenda + I’m a workaholic), even disconnecting for two or three days is the perfect opportunity for me to just zen out and think about nothing. For me, summer always starts Memorial Day weekend when my boyfriend and I head to Palm Springs for the long weekend to sit poolside at the Ace Hotel. It’s the perfect place to sit, do absolutely NOTHING and enjoy tropical drinks and tasty snacks while you flip through that stack of magazines you’ve been meaning to go through for months now. The 90 degree weather gave me the best opportunity to pull out a new Lilly Pulitzer favorite. Lilly and summer seem to go together hand in hand and whenever I’m in a Lilly dress, no matter where I am, it makes me feel as if I was sitting in an adirondack chair in Nantucket enjoying the summer sun. Now that’s a bit of magic, especially if I’m sitting in an overly air-conditioned desk chair in my office. The Ace is perfect for those looking to spend a few days doing absolutely nothing. With amazing room service, a gym, a spa, a puppy park and two different pools you’re pretty much set for everything you might need. We always go for a room with a small private deck with a fireplace so we can eat room service on our little patio, enjoying the warm air. Seriously, I never wanted to leave. The Valli Printed Shift Dress in Resort White La Via Loca was the perfect dress to wear to brunch on our last day in Palm Springs. I was worried that the 4 might not fit over my kinda large chest, but as I put it on, any worries were erased. It did a great job of hugging my body and the slight v-neck showed a hint of cleavage without showing too much. Like so many Lilly dresses, I just couldn’t get over how much I love the print. That, and the fact that it was a seersucker like fabric had me sold the minute I slipped it on. Aw, thank you! It's hard not to be smiling while wearing Lilly! How beautiful! I have always loved Lilly Pulitzer. Her prints are so fun and vibrant! LP is my girl and I love this shift! It is gorgeous on you! LOVE your lilly dress! I definitely need to add one to my summer wardrobe, because you are right summer & Lilly go together! Love this print! Lilly has the cutest ones for summer! LOVE the Ace! Such a fun hotel! Love the dress and I live that bag. So cute! Loving that dress on you. These pictures are amazing!! I love that dress! 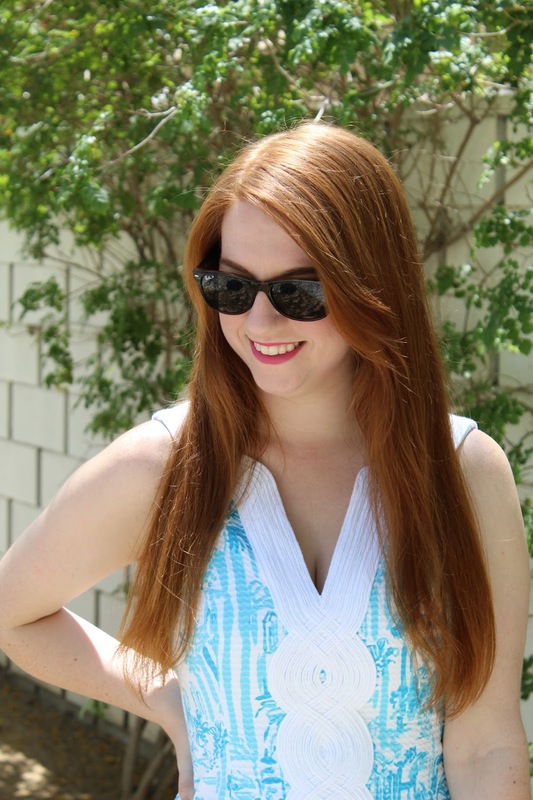 The blue and white color combo is one of my favorites for summer! I need to get to Palm Springs! 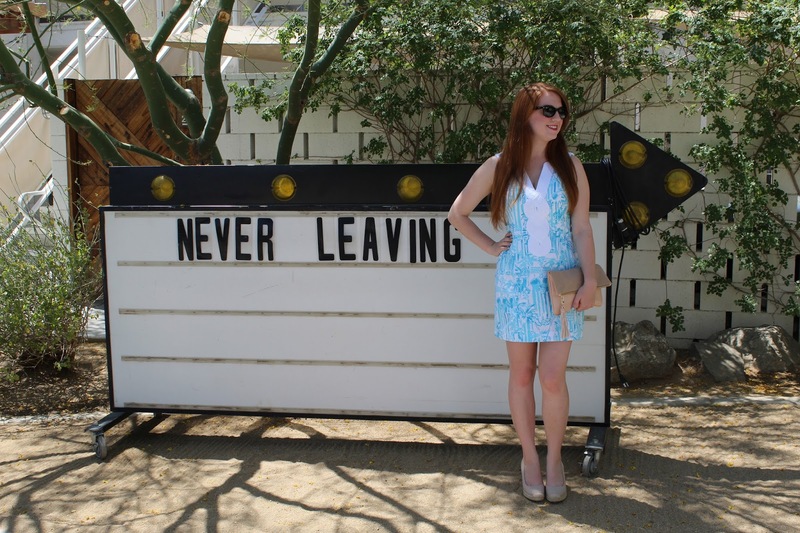 It's not far from Phoenix at all 🙂 What a great dress — so fitting for your location, too! Love it! Your hair color is beautiful! Is that your natural hair color? I love this LP dress! I still have yet to get my hands on a LP dress!